The animals continue to make their way through the rain and mud, but are now approaching farm land. They join Owl, Kestrel and the Pheasants who are sheltering in a group of trees. 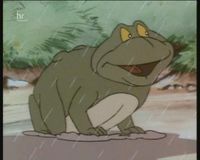 Toad, who is loving the rain, goes in search of a better shelter. He comes back just as the rain is beginning to come through the trees. Toad has found them a nice dry barn to rest in. Fox is worried about the humans, but as Owl points out Any bolt hole in a storm . They arrive at the farm and with Kestrel keeping watch outside the barn, the weary animals are soon asleep. The rain stops and Kestrel comes inside to ask Pheasant to take his turn on guard, but he refuses to wake up. To avoid an argument, Pheasant’s wife goes instead. Shortly after, the farmer comes out with his useless dog, Bruno. He is furious with Bruno when he discovers that a fox has attacked the chicken coop and killed the chickens. 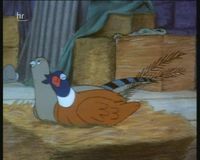 The sound of the farmer kicking his dog alerts Mrs Pheasant, who heads to warn the others. She is spotted by the farmer who shoots her. The gunfire wakes the other animals. The farmer spots Fox in the barn and locks the animals in while he goes to reload his gun. Pheasant is devestated by his wife’s death. The trapped animals spring into action, desperate to find a way out of the barn. Owl comes up with a plan to dig their way out, and once the floorboards have been chewed through, Mole begins digging a tunnel. Meanwhile, Adder goes outside to frighten Bruno into keeping quiet. Fox is the last animal to escape down the tunnel. As he does so, the farmer returns. In anger he fires a shot down the tunnel, but Fox has already emerged out of the other end. 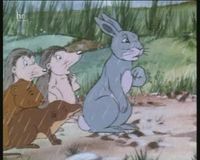 The animals head towards a nearby copse, but it soon becomes apparent that Bruno is on their trail and catching up fast. Bravely, Fox heads back to confront Bruno and manages to confuse the stupid dog. Arriving safely at the copse, the animals settle down for a rest. Pheasant is crying over his wife. Who’s going to dig for my grubs now? he wails. 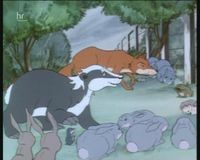 Suddenly Badger comes to a realisation—They have left Adder at the farm!